Want to know how much you could earn from online courses before you make one of your own? 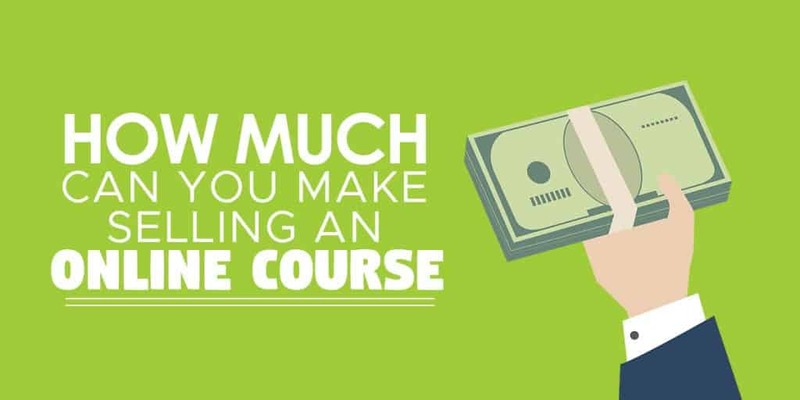 How much can you make selling online courses? It varies widely. Your online course could earn anywhere from a $0 – $50k+ per month. Many course creators will earn $1 – 5k/month and there are numerous examples of online course teachers earning $10k – $50k per month.. There are lots of factors that will determine how much you can earn by selling online courses. Some of the big ones are the price of your course, the size of your niche, and how large of an existing audience you have. In this article you'll learn how much you can make selling online courses. As well as how much you should charge for your course, and other factors that will determine how much you earn. There are a bunch of factors that will determine how much you'll earn from making an online course. Numbers vary widely and there's not really a general figure I can give you. The number could range from zero to millions of dollars per year. We can look at some numbers that Teachable, a popular online course platform, has released to help get a good idea. They looked at their ‘top course creators’ – defined as those whose sales make up 80% of all of the revenue generated by schools using the platform. The analysis also showed that, each month, about 18% of schools on the platform earn more than $10,000 per month. So your chances of earning more than $100,000/year from your own online courses aren't that far fetched if you put in the work. And putting the work in is the essential ingredient here. If you don’t put the thought and effort in to how you create and market your course, you could just as easily earn nothing from the process. It’s really important in particular to think about the topic of your course, define who exactly it is for, and validate that people would buy the course you’re thinking of creating. Then you must ensure you build an engaged audience and market your course well. Assuming you do all of this, the biggest elements that determine how much you earn will be the price of your course, the size of your audience or following, and the total size of your target market or niche. The price of your online course will play a big factor in how much money you earn each year. If your course only costs $25, you'd need to sell 2,000 copies to earn $50,000 in a year. Meanwhile if you were to sell your course for $250 instead, you'd only have to sell 200 copies in comparison. What do you think would be easier, selling 200 copies of a course or 2000? Of course selling a cheaper course is easier. People are more likely to impulse buy a course that only costs $10 or $20. But surprisingly, the cost isn't really that much of a factor up until your course starts to cost more than a couple hundred dollars. People will really have to stop and think before paying $500 or $1,000 for a course. But most people with full-time jobs wouldn't hesitate too much over paying $100 or $200 for a course, as long as they were interested in the topic and understood the value they would get from it..
For that reason I'd recommend trying to make a more in-depth, high-quality and higher priced course to maximize your earnings, instead of pumping out a larger number of small lower cost courses. And don't be afraid to charge more for the value you're offering. I'd price your online course based on the problem that it solves, and how in-depth your solution is. Small problems. For a course that solves a small problem, expect people to pay up to $50 for it if you're just explaining what to do in a general way. If your course shows them how to do it and walks them through step by step, you could charge up to $100. Example: A course that teaches people how to read faster using a few different speed-reading techniques. 5-10 videos and a couple of PDF files with instructions. Medium sized problems. For a course that solves a medium sized problem, you should charge between $200 and $500. Example: A course that shows you how to successfully run Facebook advertisements. 10+ videos and in-depth instructions. Large problems. For a course that solves a major problem or offers unique or valuable tuition, there's no issue with charging $500 to $1,000+ as long as you deliver enough value for the price tag. Example: A comprehensive training program on affiliate marketing with 25+ videos, worksheets and exercises, and support. I'd recommend staying under the $1,000 course threshold, at least until you have a fair bit of experience creating and selling high level courses. Above this price point you need to really work on your positioning, pitch, marketing and offer super high value. Someone who has a Youtube channel with 100k followers and an established blog or website is going to have a significantly easier time selling an online course than somebody who seemingly popped up overnight. That's because they already have an established brand and reputation, as well as a level of trust established with their existing followers. Every large brand has a good amount of die-hard followers who will buy whatever product you release. If you're releasing a brand new course with no existing audience you don't have that luxury. No one knows about you, and it will be harder to get those first few sales. You’ll need to really work at it, build trust and probably offer your course at a lower rate for a while to build your first tribe of happy course customers. Once you have case studies and testimonials proving that your course is great it will become much easier to sell and at a higher price too. How much disposable income your audience has will determine how many of them are willing or able to buy your course. You could release a $100 course to help people escape homelessness, but your target audience doesn't have that kind of money to spend on a course! If you're making courses for children you'll likely run into the same problem. They won't have the disposable income to afford your course unless their parents are willing to pay for it. Obviously, it doesn't even have to be that extreme. The audience for an online course teaching the basics of basketball likely has a lower income than an online course about sailing or snowmobiling. That's just because the barrier to entry is much lower to play basketball than to go sailing. They only need to buy a ball and a hoop, instead of an expensive piece of machinery. Intuitively you should be able to pretty accurately guess what kind of income your target audience has, depending on the topic that you're covering, and this element will have some impact on how much you could earn. Ideally you want to find a very large market with very low competition. But those are quite hard to come by. If such a market existed, other courses will quickly appear to take advantage as well. I'd avoid large markets if they have extremely high competition. For example, making an online course about the keto diet. I'd also avoid extremely niche topics with small market sizes or very simple topics. For example, an online course on kite flying. Anything that's a hobby or skill that a fair amount of people are interested in will be a pretty safe bet, and anything that effectively teaches people how to earn money or solve a pressing problem is also usually a good place to start. For more info on choosing an online course topic, check out this article. How much you earn from your online course will also depend on how much you're willing to put into it. Are you just making a basic introductory course? Or are you making the ultimate guide to your particular topic? People are willing to pay a higher price for a more comprehensive course, but you have to let them know why it's worth the higher price tag too. Things like video and audio quality play a part in this. You should charge more for a course if you produce it using expensive camera and microphone equipment compared to someone who is just recording videos on their laptop. Also, offering some form of community or ongoing support will enable you to charge more and it can help to build a sense of community amongst your students. Building this leads to more testimonials and the possibility of learning about what else your customers might want to learn about in future courses that you could make. Will paying for advertising increase my course income? It depends. Effectively using ads can dramatically increase your course earnings, while poor advertising can lose you money. You should look to get back between $2-10 from every $1 you spend on advertising if you've got successful ads. That includes money people pay directly for your courses, as well as any upsells or downsells or affiliate sales from the course too. If you're making more from your ads than they cost, then simply increasing your advertising spending can really increase your overall sales! What are some other ways to increase my income from online courses? Consider charging a subscription instead of a flat fee. Lots of people are willing to pay recurring fees every month or year to keep their membership, especially if you are constantly adding new content to the course. You can also use a tiered payment system that offers more expensive versions to access advanced material or more support.